Robitussin cough syrup sold over-the-counter contains two drugs: dextromethorphan, a cough suppressant and guaifenesin, an exectorant. When taken in large amounts, both drugs can have side effects, although the side effects of dextromethorphan are more serious. Robitussin is often used as a recreational drug because of its potent effects on the brain. In 2008, 7,988 emergency room visits were related to deliberate dextromethorphan overdose, the United States Drug Enforcement Administration reports. Between 5 and 10 percent of Caucasians metabolize dextromethorphan poorly, putting them at extra risk for serious reactions, the DEA adds. Euphoric effects and a dissociation of the mind from the body at high doses are the effects that make Robitussin a popular drug for abuse, according to Dartmouth College. Visual and auditory hallucinations, a heightened sense of perception, altered sense of time and dream-like experiences occur with deliberate overdose of the drug. Effects normally last five or six hours. Other central nervous system effects include dizziness, headache, hyperexcitability, paranoia or confusion. Paranoia can occur from the panicky feeling some people develop when they feel they're stuck in an endless "time loop" or that the effects will be permanent, according to Dartmouth University. 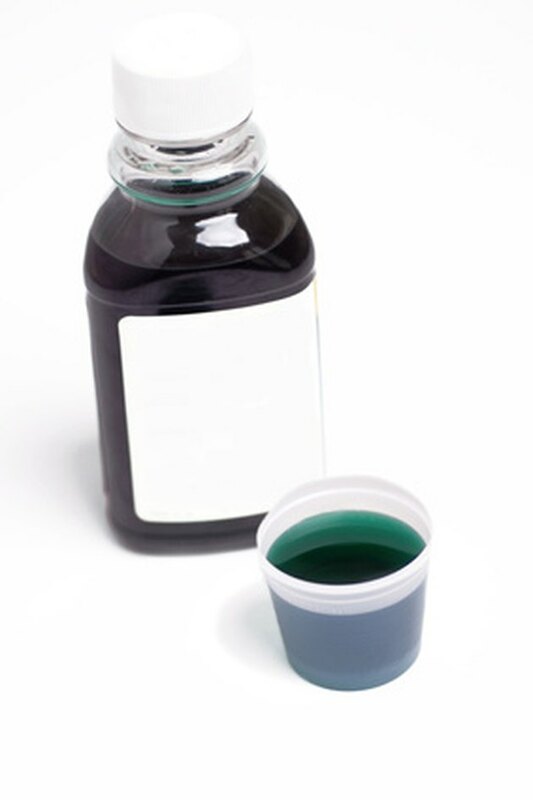 Robitussin overdose can cause a number of physical side effects in addition to mental changes. Slurred speech, poor coordination, sweating, nystagmus, a rapid, uncontrollable jittery movement of the eyeballs, dry mouth, constipation, muscle spasms or muscle stiffness, heart arrhythmias and muscle spasms can also occur. Guaifenesin can cause nausea and vomiting in large doses. The first effects of Robitussin overdose begin to appear after ingestion of 100 to 200 mg of the drug, which causes mild stimulation. At 200 to 400 mg, euphoria and hallucination start, with distorted perception and motor effects occurring with doses of 300 mg to 600 mg. At doses of 500 to 1,000 mg, dissociative sedation occurs. At high doses, dextromethorphan has similar effects as those of phencyclidine, or PCP, the DEA reports. Combining Robitussin with other drugs is most likely to cause a reaction that can lead to death. Taking other depressant drugs at the same time can result in respiratory depression. Dextromethorphan and other drugs that cause dissociative effects, like Ketamine and PCP, can cause Olney's Lesions to form on the brain. Brain damage in the form of memory loss, cognitive effects and emotional changes can occur and may be permanent. Epilepsy and permanent psychosis can result. Is Xanax Mixed With Caffeine Safe?